Tarte flambée is an Alsatian dish composed of thin bread dough rolled out in a circle or a rectangle, which is covered by crème fraîche, onions and bacon. It is one of the most famous gastronomical specialties of the region. Depending on the region, this dish can be called in Alsatian flammekueche, in German Flammkuchen, or in French tarte flambée. There are many variations of the original recipe, in terms both of the dough and of the garniture. Legend says that the creators of this dish were those Alsatian farmers who used to bake bread once a week. In fact, the tarte was originally a homemade dish which did not make its urban debut until the "pizza craze" of the 1960's. 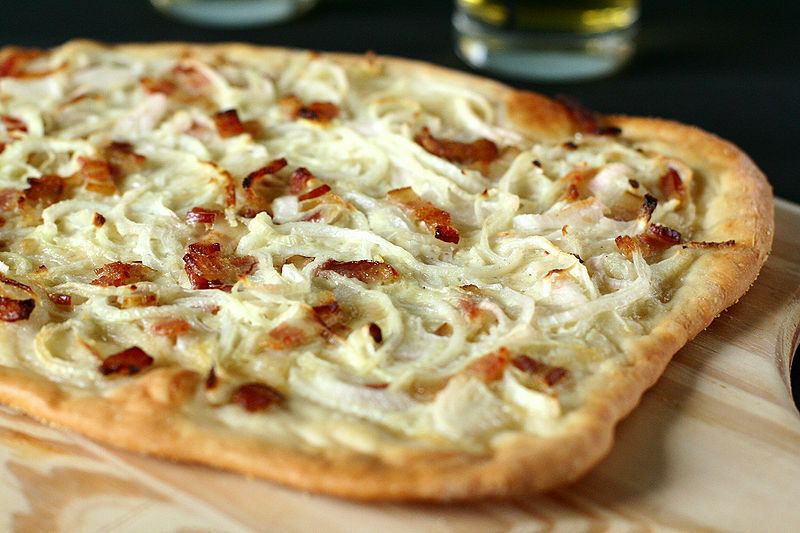 A tarte flambée would be used to test the heat of their wood-fired ovens. At the peak of its temperature, the oven would also have the ideal conditions in which to bake a tarte flambée. The embers would be pushed aside to make room for the tarte in the middle of the oven, and the intense heat would be able to bake it in 1 or 2 minutes. The crust that forms the border of the tarte flambée would be nearly burned by the flames. The name itself comes from this method of baking, the English translation of the original Alsatian name being "baked in the flames." In some parts of Alsace the crème fraîche may be replaced by fromage blanc (similar to Quark), or by a mixture of half fromage blanc and half crème fraîche. The result resembles a thin pizza.